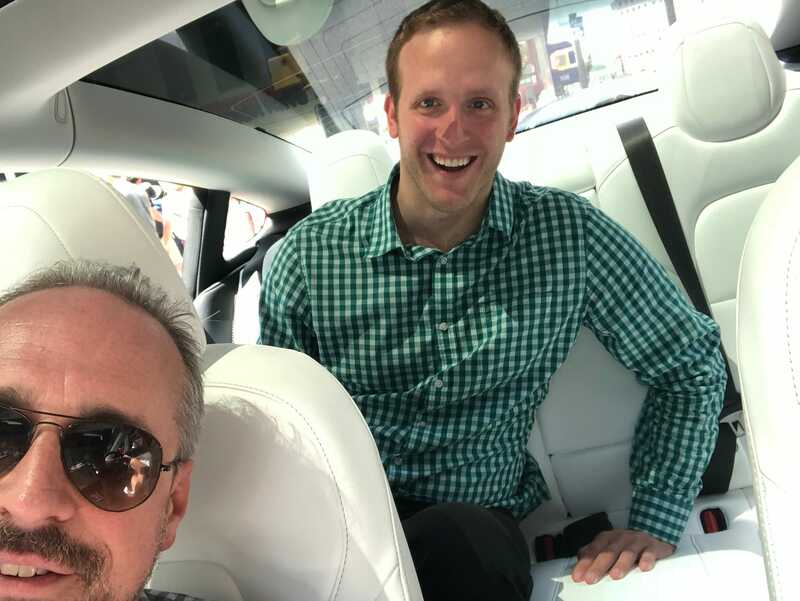 Matthew DeBord/BIThe Tesla Model 3 Performance. 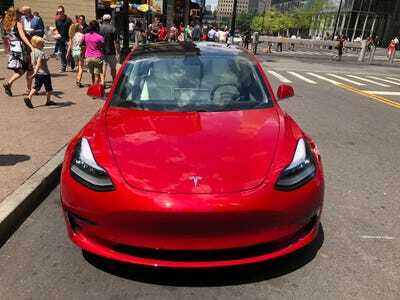 The Model 3 Performance has two motors and can go from 0-60 mph (0-97 kmph) in 3.5 seconds, with a top speed of 155 mph (250 kmph). A “base” Performance version can be ordered for $US64,000; the car I sampled was fully loaded, at $US78,000 ($AU105,400). 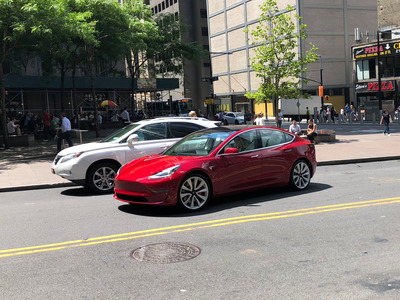 Here’s the bottom line: I really, really, really liked the Tesla Model 3 when I drove it earlier this year – but I like the high-performance version much, much better. Earlier this year, I took my first proper spin behind the wheel of the Tesla Model 3, perhaps the most anticipated car in the history of the automobile industry. 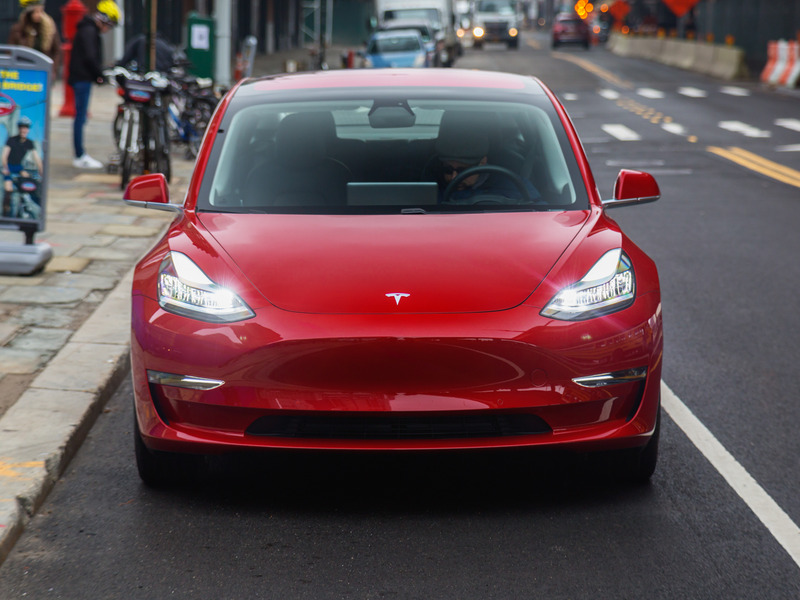 I had driven the Model 3 for about 15 minutes when it was launched in July of 2017, and I was impressed. The few hours that Business Insider had with the well-equipped $US57,500 rear-wheel-drive version of the vehicle reinforced all my initial enthusiasms. That was just the appetizer, however. 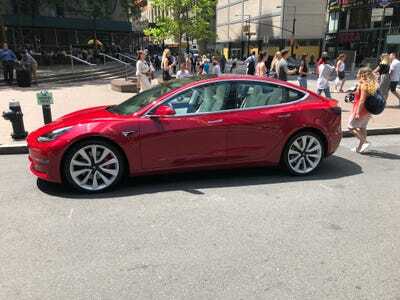 The entrée arrived this week: the $US78,000 high-performance, dual-motor, all-wheel-drive Model 3. 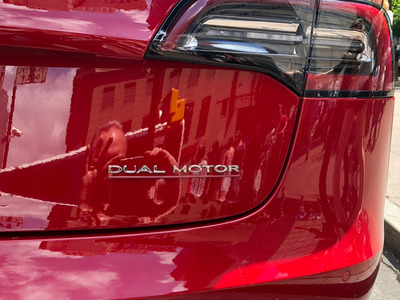 Tesla has labelled its previous cars in this category with a “P” (for performance) and a “D” (for dual-motor), along with the kilowatt-hour designation of the battery. Thus, the high-performance AWD Model S with the biggest battery available in the P100D. Not so with the Model 3. The trim I sampled doesn’t have Model 3 badging at all and get just a “Dual Motor” label on the rear. Tesla refers to it as the Model 3 Performance. I had a few complaints about the Model 3, but they have faded with time. And my main beef with what I’ve been calling the P3D was with the elevated pricing. But Tesla has adjusted it, so that a “base” P3D can be had for $US64,000. 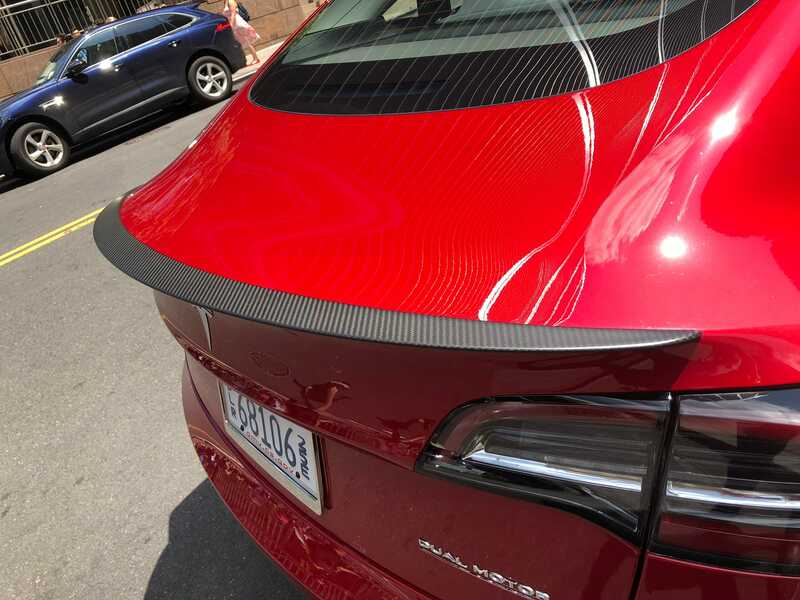 If you take a pass on some of the upgrades, you get a considerably better driving experience than what the tricked-out RWD Model 3 offers – for less than $US10,000 extra. 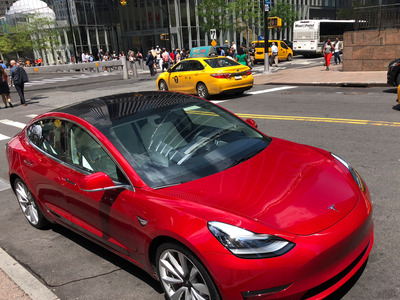 The P3D is an important evolution of the Model 3 for Tesla, which isn’t currently manufacturing the no-frills $US35,000 version of the car (that vehicle will have a smaller battery than the Model 3’s now on sale, as well as a more bare-bones interior). Tesla needs revenue, and the pricey P3D will bring it in. 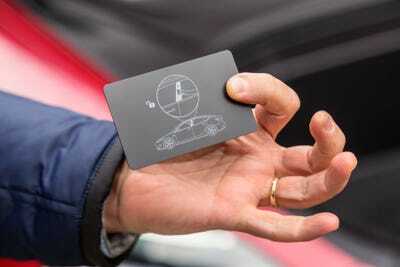 Besides, the company’s history is that buyers tend to flock to its more expensive cars, at least initially. The naming is as I already indicted, new for Tesla. I’ve been calling the Performance trim level of the Model 3 the “P3D,” but Tesla simply refers to it as “Performance.” The base price for this car is $US64,000 (versus the $US78,000 that was originally announced), and Tesla says that if you order one now, you’ll get your vehicle in two-to-four months. 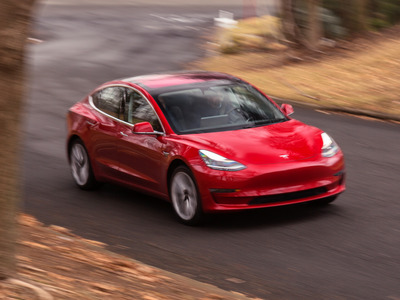 The other currently available versions of the Model 3 both have the same long-range battery as the Performance trim, good for 310 miles on a single charge. They only come with a Premium interior. The rear-wheel-drive starts at $US49,000; and the dual-motor, all-wheel drive takes that to $US54,000. Just to get the specs out of the way, the RWD does 0-60 mph in about 5 seconds, with a top speed of 140 mph; and the dual-motor clocks the same 0-60 mph run in 4.5 seconds, topping out at 145. The Performance spec shaves a full second off the 0-60 mph sprint – 3.5 seconds – and raises the top speed to 155 mph, which of course is just shy of 100 mph faster than the legal speed limit in much of the USA. 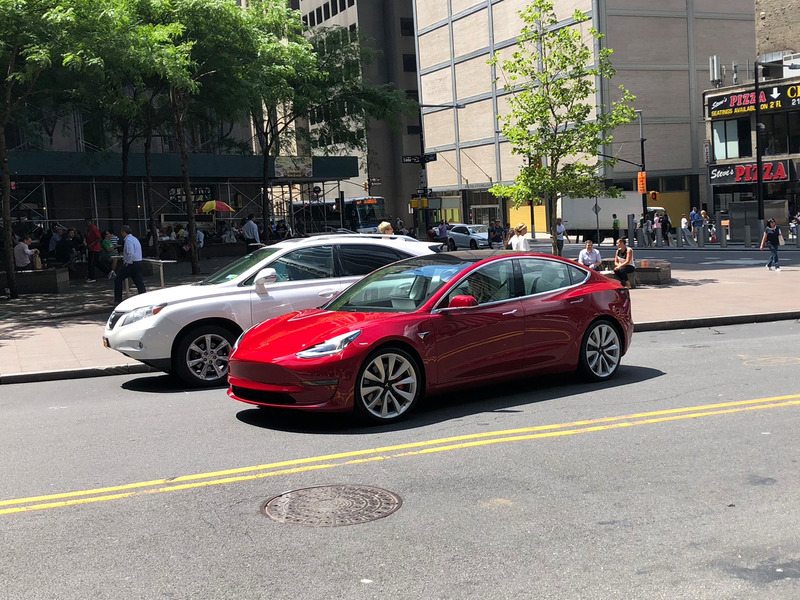 The Model 3 Performance doesn’t look outwardly any different from the Premium-spec Model 3 we sampled earlier this year. Same colour, in fact: “Red Multi-Coat,” a $US2,000 extra. We genuinely enjoyed the Model 3 once we got to drive it around for a few hours. At the time, I’d say I tempered my enthusiasm, because of the car’s sheer new-ness. When you get down to it, the Model 3, from a car company that’s just 15 years old, is an awful lot of car for the price. Radically different propulsion, tech galore, high-calibre semi-self-driving. But we derived such joy from taking the wheel that we didn’t much want to give it back. Some of that might be because driving an all-electric car is different from driving a gas car. But much of it can be attributed to the Model 3 being simply good. And as Tesla improves it in the coming years, truly great isn’t out of the question. The Model 3 is smaller than the Model S, but to my eye it’s a sharper set of wheels. 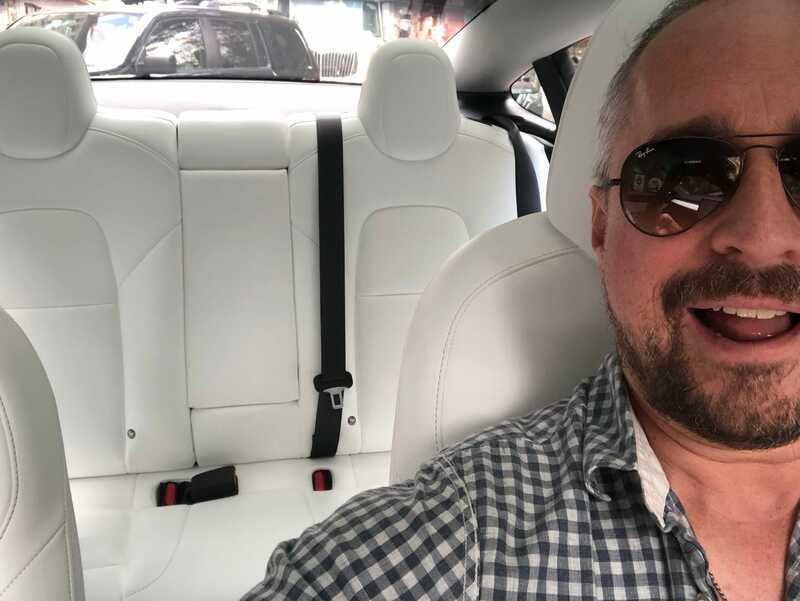 Designer Franz von Holzhausen created a sleek yet roomy car in the Model S that pushes toward being a full-size four-door. The Model 3 has a far sportier vibe. There’s a backward-sweeping glass roof that’s something of a signature feature. In addition to the lowered stance, the Performance 3 has a carbon-fibre spoiler to enhance grip at higher velocities. The car also had 20-inch performance wheels as an upgrade, along with stouter brakes, hence the red calipers, and two-piece discs. The tires were Michelin Pilot Sport 4S’s. Throw in aluminium pedals and you have the $US5,000 Performance Package. 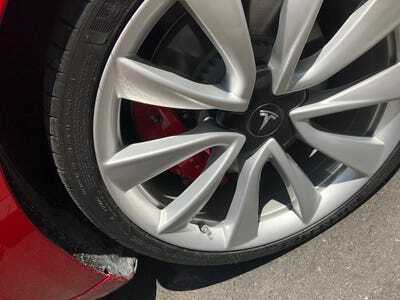 In his review of the Model 3 for the Wall Street Journal, Dan Neil suggested that the car could use grippier tires, but he was pushing the machine hard. For the type of spirited driving tha most owners will undertake, the Pilot Sport 4S’s – superb rubber – will be more than dandy enough to get the job done. 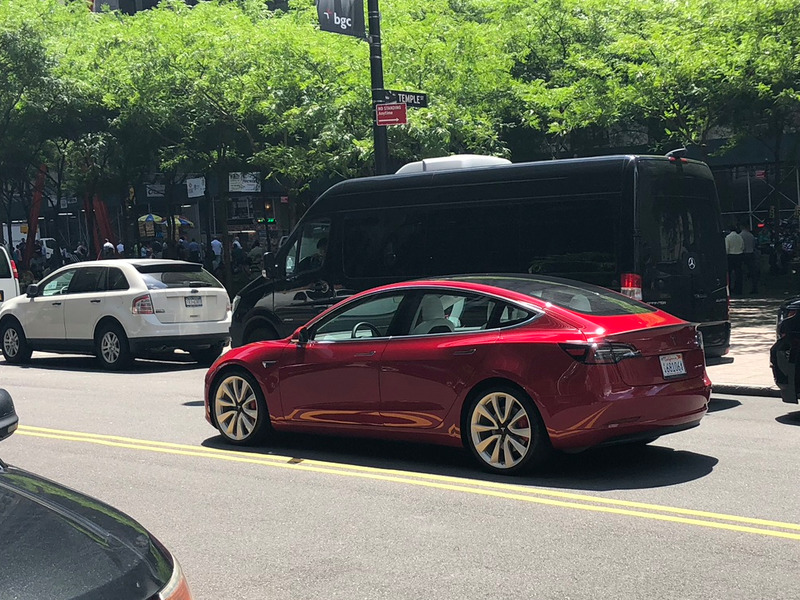 You can can barely tell that this car is the beastliest Model 3. The only overt tip beyond the wheels, tires, and spoiler is the “Dual Motor” designation on the right rear corner corner of the hatch. 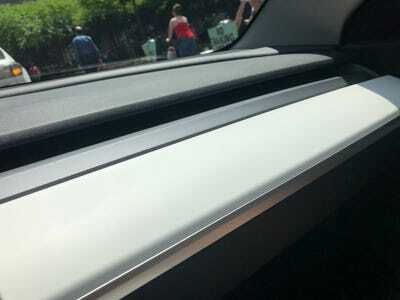 The door handles are aerodynamically flush, but unlike those on the Model S, they don’t self-present — you have to toggle them to open the doors. Before Tesla brought the car by, I was jonesing for the famous white interior (pretend leather, by the way). Our previous Model 3 had black. It’s no exaggeration to say that the white is VASTLY more memorable. 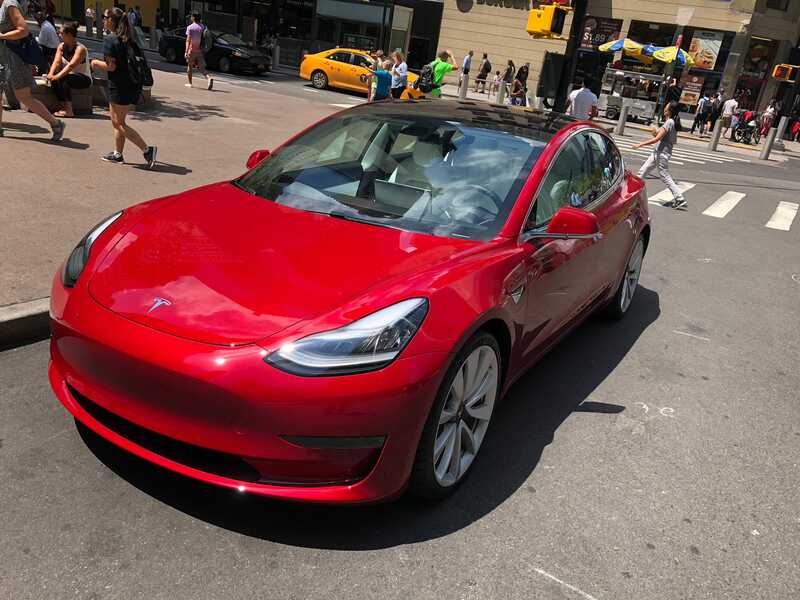 The red exterior paired with the white interior really sends the Model 3 into the stratosphere. And according to the carmaker, it’s not as difficult to keep clean as you might expect. I can vouch for that, after taking my family – lovely wife, three kids, and a dog – on a multi-day roads trip in a Model X with a white interior. That’s our BI intern Brian Pascus, checking out the very roomy rear seat. Brian is a tall fellow and he fit back there without difficulty. From the driver’s perspective, the interior is like nothing else on the road. The interior is groundbreaking. It’s the most minimalist I’ve ever experienced in a car not intended for racing competition. I’ve already offered a take on why the minimalism is magnificent . 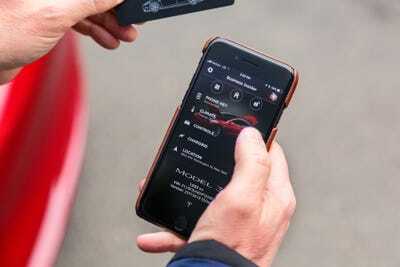 But in a nutshell, while the Model 3’s interior doesn’t wrap you in luxury or exude a spirit of sportiness, it does provide the sense that you’re interacting with a piece of made-in-Silicon Valley technology. 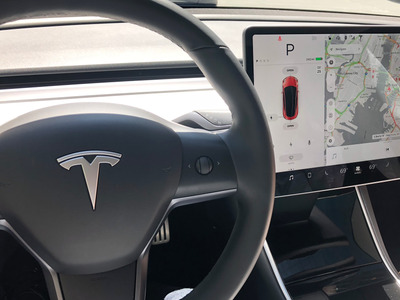 I’m not going to get into Tesla’s infotainment setup for this first-drive of the Performance Model 3; we’ve covered it elsewhere. 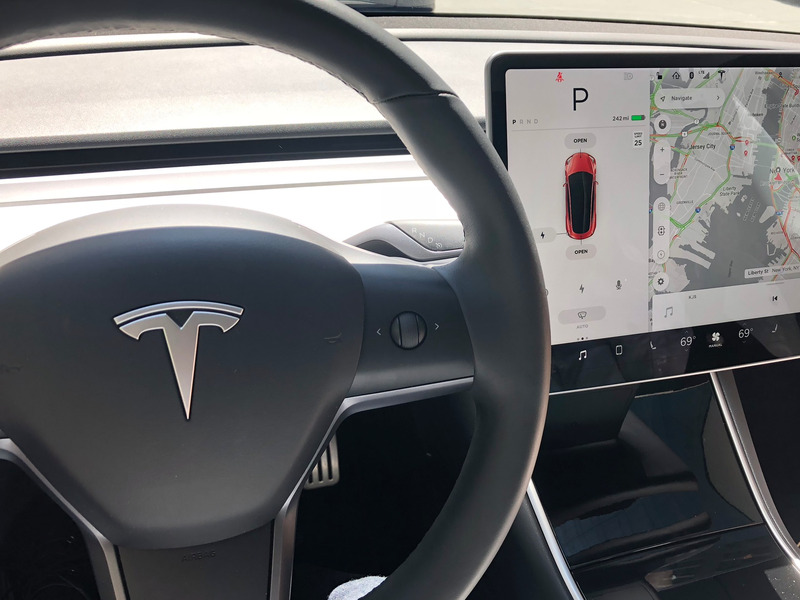 Suffice it to say that voice recognition is excellent, the Tesla-designed audio system sounds fantastic, and once you spend a few hours with the big screen, you get used to it in a hurry. Having no instruments in front of you, with essentially just a speedometer on the far left-hand-side of the touchscreen, makes for a wonderful driving experience. In no other car have I been able to as fully focus on the road in front on me, free from distractions. A head-up display isn’t needed, despite plenty of calls from one by some reviewers! 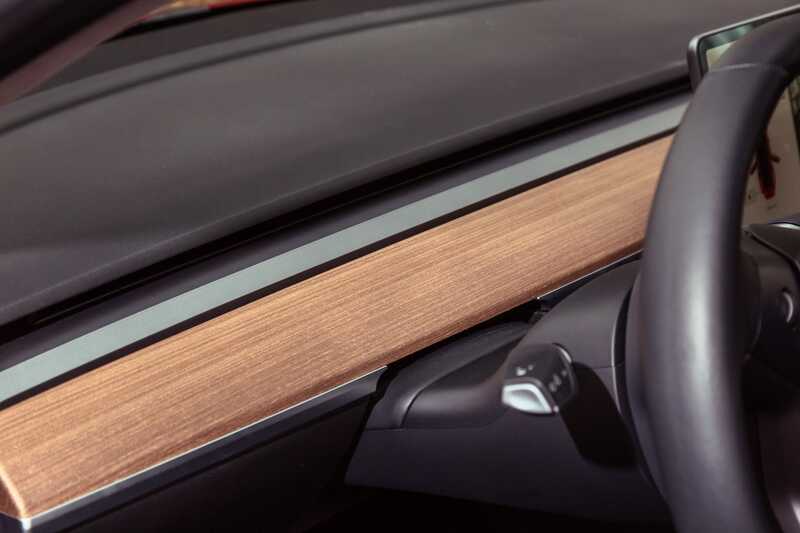 With the white interior, you don’t get the single piece of open-grain wood, extending the full width of the dashboard, that we saw on our previous Model 3. Instead, you get this strip of brushed aluminium. Here’s the wood version, for comparison. It delivers a more mellow, Scandinavian vibe, while the aluminium version exudes speed and space-age-ness. I drove the Performance 3 around Manhattan for about an hour, so I wouldn’t call this a true first-drive evaluation. We plan to fully test the Model 3 later this year, so stay tuned for that. Still, on the FDR Drive and West Side Highway, I was able to open up the P3D and let it rip a few times. I wasn’t able to dive into any corners, but I did dart in and out of traffic, and obviously, I have plenty of time to appreciate the ability of this 4,00o-lb. plus vehicle to soak up New York City’s crumbling infrastructure. 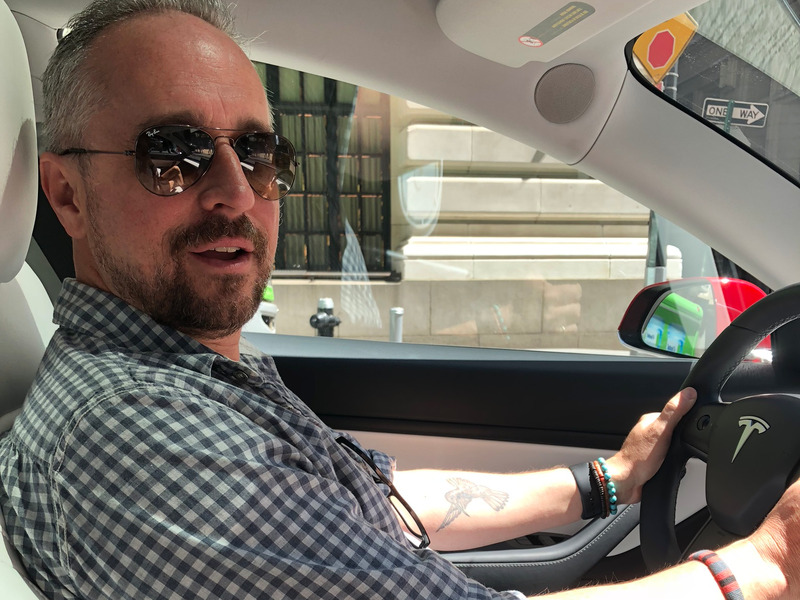 I fiddled with Autopilot briefly, but then I said, “Scratch it!” Autopilot can be tricky to use in NYC traffic anyway – and I wanted to drive this car, baby! This is a good time to review the overall technical profile. The big battery sits under the floor in the middle of the car; it’s a 75 kWh unit, using Tesla’s new 2170 cells, with nearly 4,500 of them wired together. Combined, the dual motors lay down 450 horsepower to the pavement. That compares with 271 hp for the Premium 3 with RWD and 346 hp for the AWD non-Performance variant. Those 450 horses aren’t snarling and violent, by the way. That’s why we have BMW M4s and Mustang GTs. The Model 3 Performance has access to 100% of its mesmerising torque at 1 rpm, so the transfer of electrons from battery through software to motors, and the ensuing alchemy of speed, is dizzily linear. There is no lurch. Velocity simply happens. It’s like you’ve Vulcan mind-melded with the laws of physics. Yes, it’s a bit cold, just like Mr. Spock. But it’s the cool that kicks your arse. If you prefer more visceral thrills, there’s no shortage of snarling V8s and twin-turbo sixes in the world to fill the need. The Model 3 promises to ultimately be an extremely versatile platform. 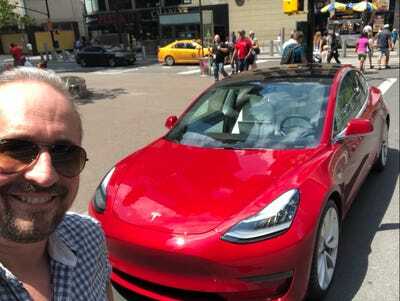 When Tesla finally gets around to selling the $US35,000 economy-class version, we’ll have stylish electric transport for those on a budget. I’ve driven every Tesla the company has built, and my longtime favourite is the original Roadster, no longer in production. Well, it was my favourite. That honour now goes to the P3D. 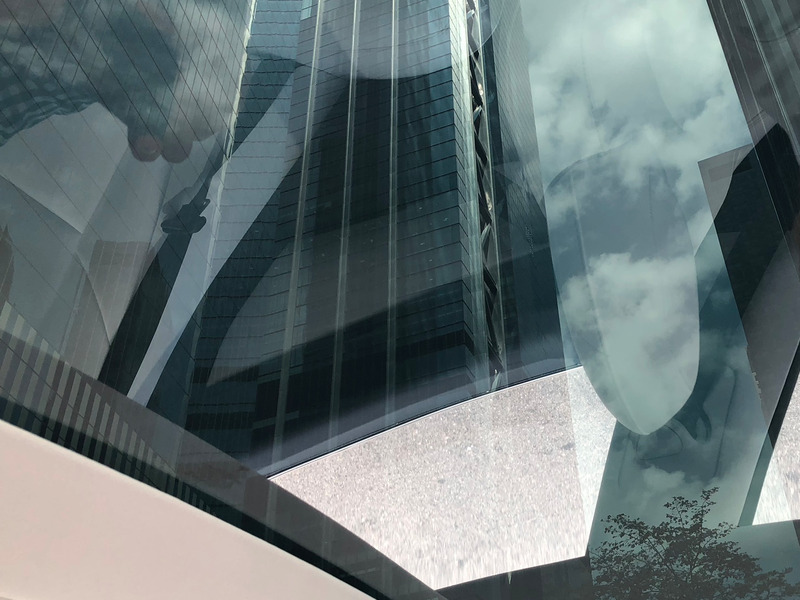 Everything about this car is what the driver of the future wants – the studiously minimalist interior, the omnipresent technology, the refreshing absence of traditional luxury filigree – joined with what forward-leaning enthusiasts crave. 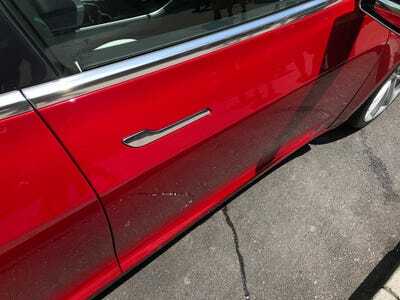 Sure, Tesla has more than its share of problems getting the Model 3 on the road. But when the rubber finally meets the road … Zowie! The overdesigned fancifulness of the Model 3 and the practical family-sedan girth of the Model S is forgotten and you’re back in spiritual Roadster territory, but with countless exciting updates. And make no mistake, laying in the P3D’s sci-fi throttle never gets old. The addictive electric WHOOSH! is to Tesla what the wild wail of a screaming gas-incinerating V8 is to Ferrari. The 0-60 mph dash does indeed seem to pass in less than four seconds. The big difference between the Performance 3 and the car I last drove is that with the P3D, the speed doesn’t feel tapped out after 60 mph passes. That could be an illusion, but I could also chalk it up to having the additional torque delivery vector with the second motor. The dual-motor Model 3 has a more compact wheelbase that than the Model S, making the car feel quite darty and light (even though, objectively, it’s sort of heavy), but the oomph delivered by the two motors brings some muscle to the party. The closest internal-combustion analogy might be the BMW M2 combined with the BMW M3/M4, with Audi all-wheel-drive stability thrown in. This mash-up takes a bit of getting used to: exceptional stability, crisp acceleration, deft braking, and point-and-shoot steering. The last one matters: the dual-motor 3 lacks “Ludicrous Mode” throttling – it’s essentially in Ludicrous all the time, unless you dial it back to Chill Mode – so you can punch this sucker all day long. Over time, however, it’s the exquisite steering that captures the imagination. 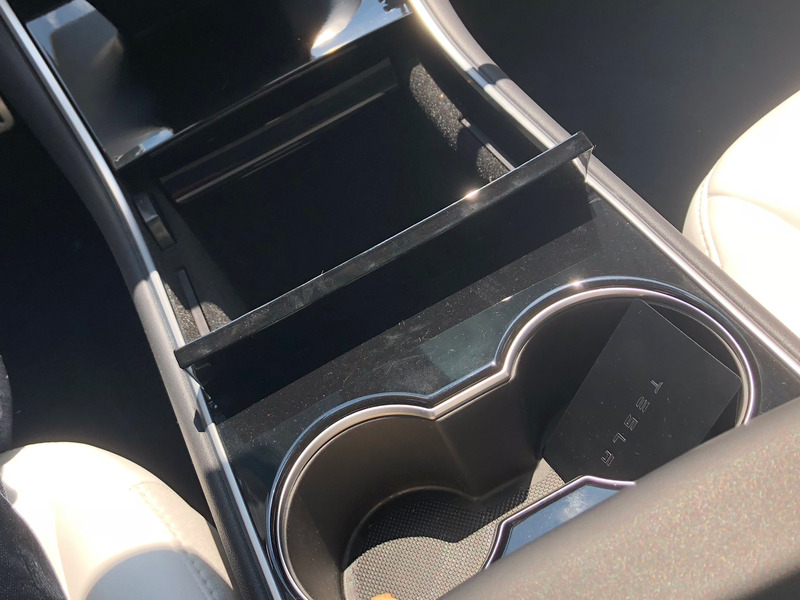 I noticed this on the single-motor Model 3 I drove earlier this year, but I noticed it far more with the dual-motor, probably because the additional grunt focuses the mind on one’s primary interface with the car. Credit is due to Tesla for the Model S and especially for the supercar-besting P100D, but I think the Model 3 Performance is the company’s best car yet. It can go toe-to-toe with the best high-performance sports sedans in the world and also give a lot of outright sports cars a run for the money, all while providing 15 cubic feet of truck space and a front “frunk” for a few more. What we have here, admiring ladies and gents and drop-jawed children, is the complete package. Beautiful outside, cool as heck inside, and a car that gets your pulse pounding when you step on it. I’m crazy about this thing. It’s pure joy with four wheels and four doors. Oh, and by the way – no gas burned and no tailpipe emissions generated to deliver this bountiful pleasure, this happy mingling of man and machine. I’m going to miss this car!